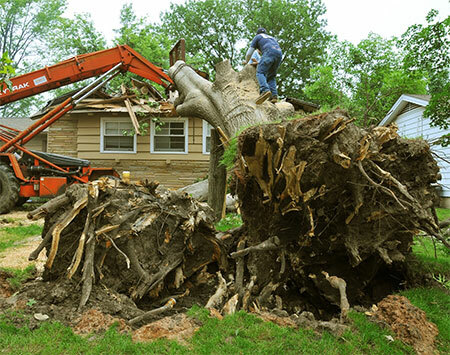 Removal can be difficult or impossible with large and old trees, which have root systems that are just too hard to take out. Stump grinding lets you avoid having to dig – after cutting off all the parts of the tree that we can remove by conventional means, we then use a machine to grind and shred the stump into mulch and chips. Afterwards, soil or fertilizer covers the stump, and that’s the last you will see of it. The chips that result from the grinding operation can be used as mulch or decoration for the rest of your yard. Tree cutting is difficult and dangerous work, and if it isn’t done properly, the process can result in injury to the person/people cutting the tree, as well as damage to structures or objects nearby. This is why you should entrust tree cutting and removal to professional tree companies that have the experience necessary to carry out the whole process in a clean and safe manner. Even if the falling tree itself doesn’t cause damage, trucks and other removal equipment can leave your property in a state of disarray, with deep tracks in the ground and damage to fences or plants. This is why we at Leaf It To Us Tree Service take every possible precaution to assess the property beforehand and use all means necessary to leave it in as good a state as we found it in.